The Farmington Valley is located in central Connecticut on the western boundary of Hartford County and the eastern border of Litchfield County. 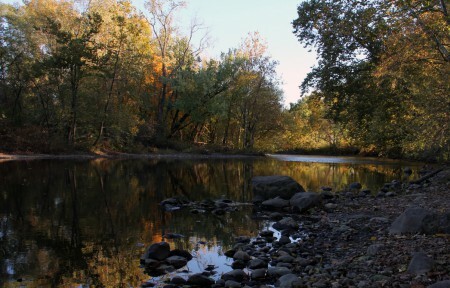 It is defined by the Farmington River which runs through it. This valley is, by simple definition, a lowland floodplain, flanked by the Litchfield Hills on the west and Talcott Mountain on the east. 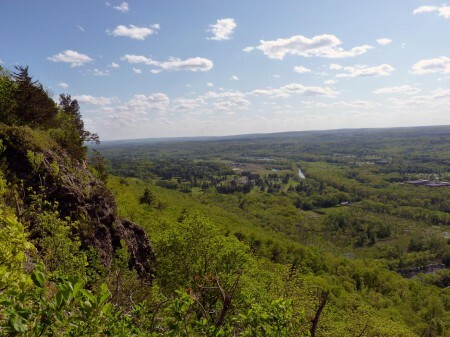 The photo below is a view of the valley from Talcott Mountain. In local terms, Farmington Valley refers to a large watershed covering areas of land from the north central portion of Connecticut into southern Massachusetts. I am most familiar with section running through the towns of Farmington, Avon, Simsbury, Canton and Granby, in Connecticut. 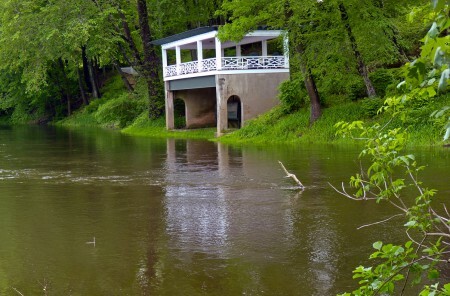 Many of my favorite trout fishing spots are on sections of the Farmington River flowing through these towns. I live in Farmington, near a patch fertile land on which the Tunxis Indians, a sub Native American tribe of the Saukiogs, established a seasonal village. They named this land Tunxis Sepus, (at the bend of the little river). 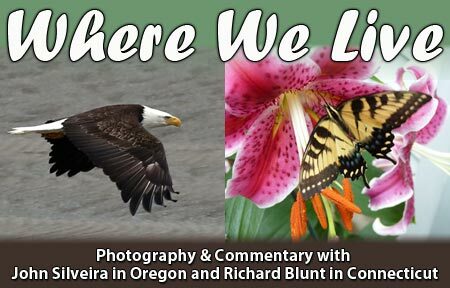 They thrived here for many years by fishing, farming, trapping and hunting the fertile waters and land in this area. Farmington residents refer to this land today as the “flats,” and it is one of the most productive farming areas in the Valley — shared by both recreational gardeners and professional farmers. 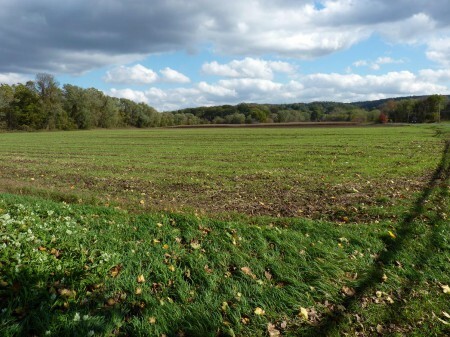 This patch of fertile land supports the crops of at least five mid-size working farms and the 225 Community Garden Plots (Kolp Gardens) sponsored by the town of Farmington. For the past 20 years I have been a daily visitor to this area, especially during the planting season. By the first of March, all of the garden plots are leased and latecomers are placed on a waiting list. The ground in much of Connecticut, along the rivers, is Windsor soil, named for the town of Windsor, one of the oldest towns in the state, famous for growing high quality tobacco used as the outer wrapping for the world’s finest cigars. 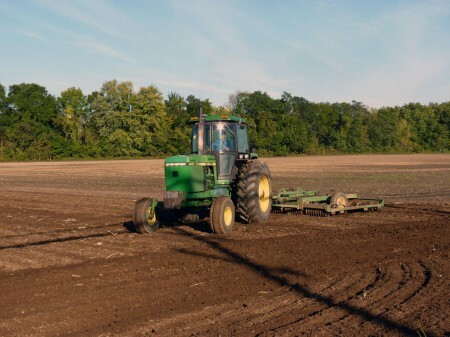 Windsor soils are very deep, well drained, fertile loamy sand soils, formed by glacial meltwater and windblown deposits. 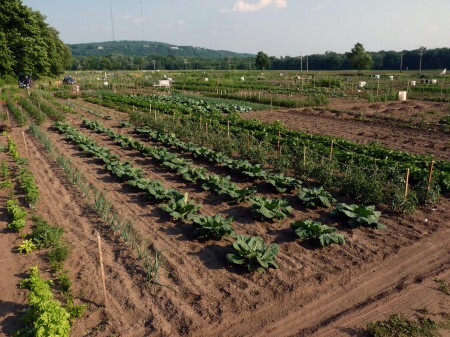 The combination of this soil and the clean water from the Farmington River makes this Community Garden one of the largest and most popular in the state. 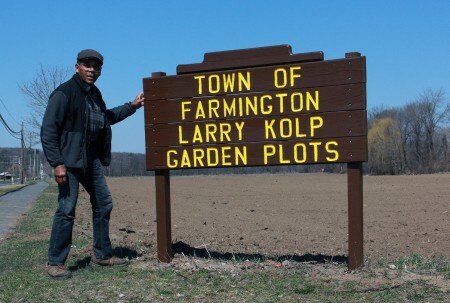 Another attraction is that the town of Farmington employed the extensive knowledge and experience of the farming professionals at Krell’s Farm to manage and care for the soil. Early European settlers found nearly all of Connecticut covered by forest. For at least 1000 years prior to the arrival of these settlers, these forests were maintained by the Native Americans. Their efforts resulted in suitable habitat for game species on which they subsisted. In 1640, Pilgrims from Essex, England, seeking land to enlarge their settlement in Farmington, bought a patch of land from the Tunxis Tribe and renamed the area “the Plantation at Tunxis”. The land consisting of about 225 square miles was incorporated as the Town of Farmington in 1645 by an act of the Connecticut General Assembly. The townspeople and the Tunxis tribe lived here together peacefully for years. Under the agreement, the settlers plowed the land, and the Native Americans cut wood for fuel and traded their corn and hides. For the following hundred years the main occupation in this town was farming. 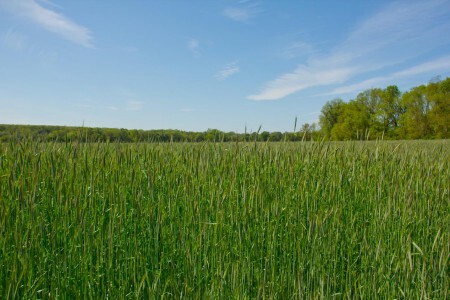 The settlers shared the meadow, raising corn, rye, barley and other crops. They also pastured cattle and sheep in the hills above the village. By 1700, the community also attracted carpenters, blacksmiths, tailors, shoemakers, tanners, and coopers (those who make and repair wooden casks and tubs). After this, the landscape across Connecticut began to changed dramatically. The settlers began clearing the land and building small subsistence farms. By the early 1800s, Connecticut’s extensive forests were mostly cleared to be replaced by thousands of small farms and towns that were built using the harvested wood for homes, barns, furniture and fuel. By 1820, only about 25 percent of Connecticut’s forest remained. Forests once thought to be unlimited had disappeared. The state began to experience soil erosion that muddied creeks and caused widespread timber shortages. Indigenous wildlife, like black bear, elk, mountain lion, white-tailed deer, quail and grouse, disappeared from most of the state. Farming, however, continued to flourish until the Erie Canal, linking the Great Lakes to the Atlantic seaboard, was completed in 1825. Within two decades of this event the small stony farms of Connecticut were unable to compete with the larger well-mechanized farms of New York and the Ohio Valley. Farmers left marginal farms to take jobs in the cities that were created by the growth of manufacturing. This abandoned farmland soon began reverting to forest, and this process has continued, causing a decline in farmland to the present day. 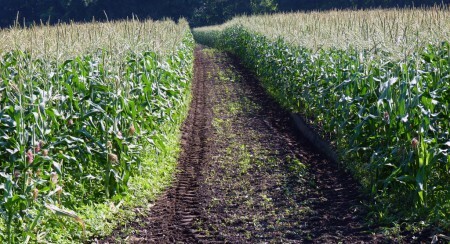 However, the state is beginning to reverse this trend and is establishing effective programs to preserve its farmland. 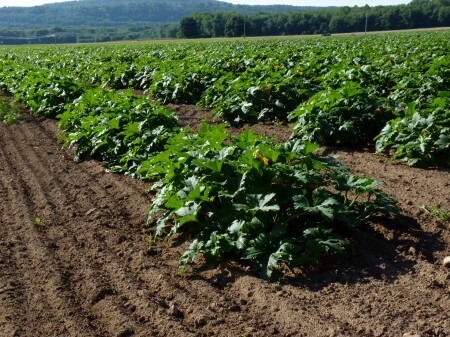 Today, Connecticut has approximately 4,200 farms which encompass 360,000 acres. 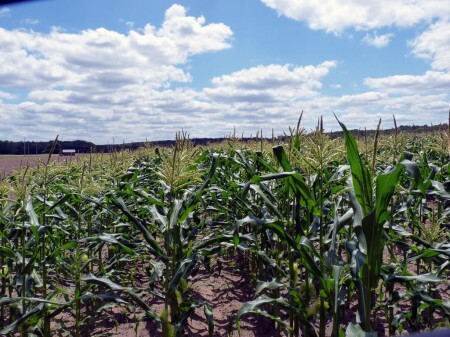 On average, each farm has only 40% of its acreage devoted to crop production. The remainder usually consists of woodlands and wetlands. At first glance, these numbers seem small, but a closer look shows that over the past few years, public interest in foods produced by the local farms in this valley has skyrocketed. To meet the demand for these foods, the number of small to mid-size farms have been on a slow but steady increase since 2002. Farm stands, both seasonal and year-round, are also increasing and most seem to be doing well. Most of the farm land in the Tunxis “flats” belongs to the town of Farmington. There is, however, an eleven-acre patch in the north/west corner that is privately owned, and is farmed by two brothers. The remainder is leased and planted by several professional farming families and the recreational gardeners of Kolp Gardens. One of the professional farmers contracts with the town to prepare the gardens each year for planting. 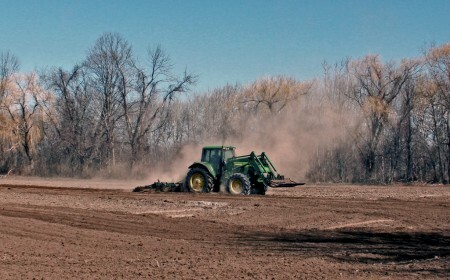 The farmer plows the soil, then conditions it by applying carefully calculated amounts of lime and fertilizer. A view of the Farmington Valley from Talcott Mountain State Park. Here the river is flowing west as it approaches the “flats.” A few yards past this point, it turns south/east and runs along the “flats” for about a mile. This is the north/west end of the “flats” where the river starts heading south/east. This is where the Farmington joins flow with one of its tributaries, the Pequabuck River (the “Little River at the bend”), turns to the north and heads towards the town of Avon. 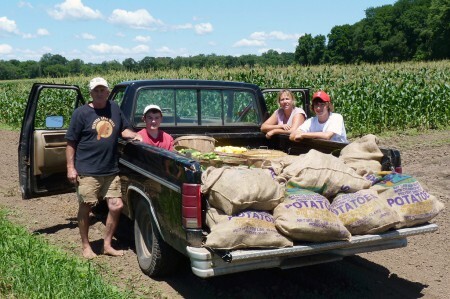 Krell’s farm stand opens in the spring and remains busy throughout the planting, growing and harvest seasons. I have purchased plant seedlings, fresh corn, fresh garlic, cucumbers, tomatoes, eggs, honey and a variety of other fruits and vegetables from this stand over the 25 years that I have been living in this area. I have never been disappointed with a purchase. Every time I ask Carl why his product is so consistently superior, his answer is always, “Good seeds.” I believe it is more than that, but I can’t argue with a pro. Both Carl and Jill come from well-established and respected farming families. They have a collective wealth of farming knowledge, and consistently select quality seeds for planting. They also plant them in a timely manner and care for them in a time-honored fashion. Their meticulous attention to detail produces some of the best looking, healthful and best tasting vegetables in the Farmington Valley. This is me being nosy and hoping to get an early shot of Carl preparing the gardens for planting. I have a small garden in front of my house throughout the gardening season; I buy seeds and plants from many of the farms in the Valley. The planting success that I have had with seeds and plants I buy from here convinces me that Carl’s claim of “good seeds” are on the money. 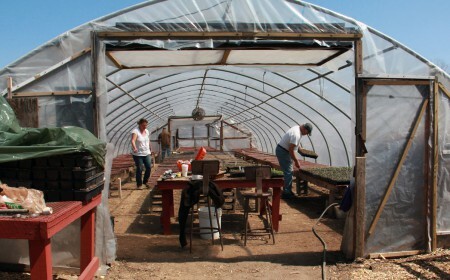 The photo below shows Carl (in the back), Jill (on the left), and an assistant setting up one of the greenhouses in the spring. As far as I could tell this is the entire crew assigned to this task. 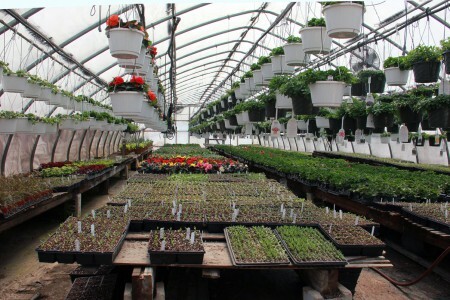 The photo below is this same greenhouse just a couple of weeks later. Carl has completed plowing and enhancing the soil in the Community Gardens. 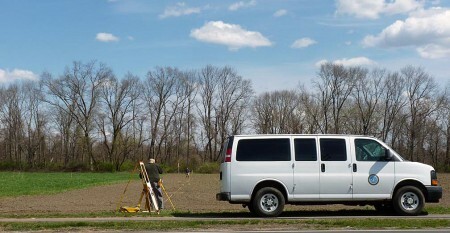 Next up are the town surveyors laying out the 225 plots. Pictured below is Tony. He has been the first gardener to start setting up his plot and begin planting for several years. Unfortunately, Tony will not be back this year. He will be missed. A view of Kolp Gardens from the north/west at mid-season. Carl and “Big Green” begin preparing the soil for Krell’s Farm vegetables. This location is one of several corn fields. 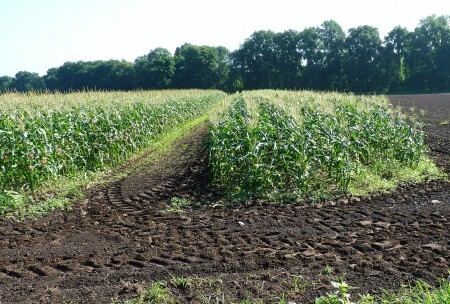 At these locations, he plants several carefully selected varieties of sweet corn. To keep the soil in place over the winter months and to have organic material to plow into the soil in the spring. Carl and the other farmers plant winter rye in the fall. The large light-green patch of rye will be worked into the soil of the Community Gardens. Mature winter rye, like this, is harvested, dried, and baled. It is later used as mulch for gardens and as food for farm animals. Not everything sold at Krell’s farm stand is planted by machine. 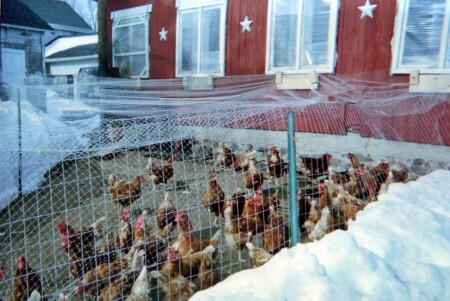 Fresh eggs are sold throughout the year. A pile of fat crappie from one of Carl’s fall fishing trip. 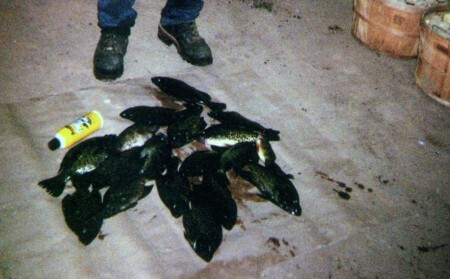 He didn’t share just where he caught these fish, but I don’t believe that he had to travel very far. Carl’s credentials include extensive hunting, trapping, and fishing skills. He has state and local licenses in all three skills. 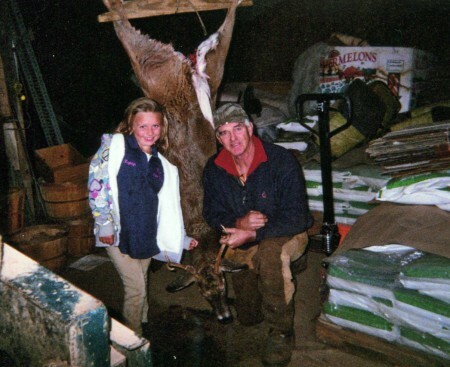 The photo below shows Carl and his granddaughter, Kayleigh, displaying the reward from their successful deer hunt this past fall. 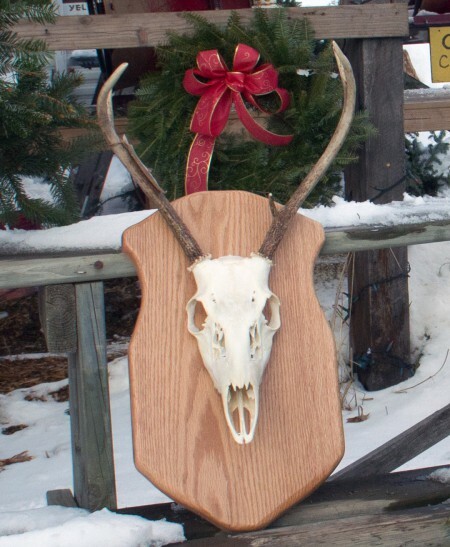 Carl processed the head, mounted it, and gave it to Kayleigh for Christmas. Carl tells me that he also tanned the hide and sent it to school with Kayleigh for show and tell. I am sure that it made the session interesting. 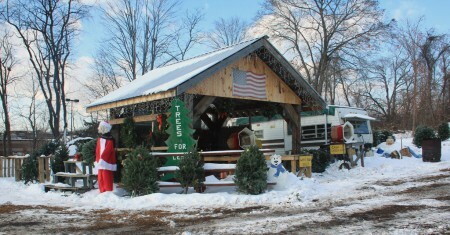 Carl and Jill’s home for several weeks before Christmas is a trailer set up on farm land owned by Carl’s family. Here they sell fresh Christmas trees. For years I have made unsuccessful attempts to buy one of their trees before they were all sold. This year I finally went early enough to buy one of their very popular, high-quality trees. My wife, Tricia, saw the tree and instructed me to get there early enough every year from now on. Here Carl is serving a customer. Every tree that Carl and Jill sell is unpacked, staked and allowed to relax. 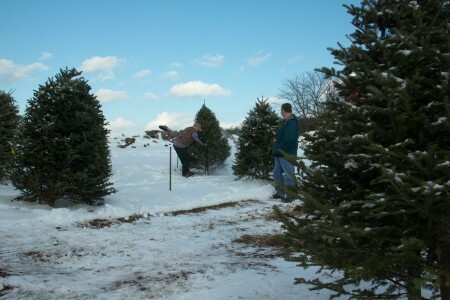 The customer can easily see the exact shape of the tree, making the selection process easy. Carl and Jill embody all of the characteristics and work ethic of farming families through this country, in particular, Farmington Valley. I am convinced that this brief outline doesn’t convey everything that is required to manage a successful farm and farm stand like Krell’s. Professional farmers, in my opinion, seem to work extremely hard and produce amazing results without sufficient recognition of their efforts. This is my small attempt to change this. 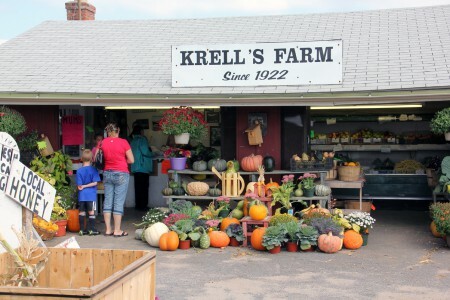 If you are ever lucky enough to visit the Farmington Valley during the growing season stop by Krell’s or one of other farm stands in the Valley. You will not be disappointed. After proofreading this post, I was surprised to discover that it contains almost twice as many words as the Homestead Act of 1862. Here I am discussing a small portion of the 18,432 acres of land that is the town of Farmington, Connecticut. The Homestead Act outlined the distribution of 270 million acres of U.S. land into the hands of individual citizens. And I don’t feel that I have said enough about one hard-working and quality-oriented Connecticut farming family. 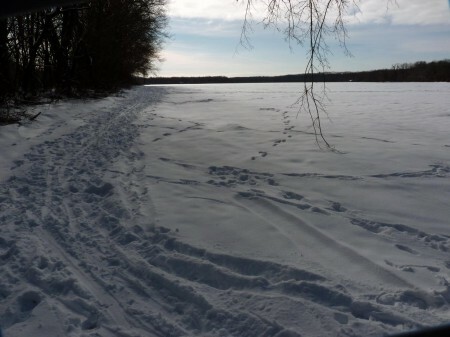 This entry was posted on Friday, January 3rd, 2014 at 7:05 pm	and is filed under Farmington Valley. You can follow any responses to this entry through the RSS 2.0 feed. Both comments and pings are currently closed.